Susan A. Ajster, 92, passed away peacefully on March 25, 2019 in Heritage Health of Peru surrounded by her family after a battle with severe dementia. Mass of Christian Burial will be 11:00 AM Saturday in St. Joseph’s Church in Peru with Rev Gregory Jarzombek OSB officiating. Burial will be in St. Vincent’s Cemetery in LaSalle. Visitation will be in the church on Saturday from 9:30 AM until time of services. The Hurst Funeral Home in LaSalle is handling her arrangements. 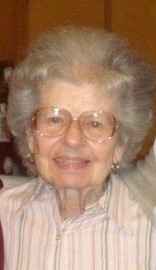 Mrs. Ajster was born in LaSalle on July 1, 1926 to James Henry and Apolonia “Mollie” (Chwalinski) Housby. She married Joseph J. Ajster on May 24, 1947. She worked at different local factories. Mrs. Ajster enjoyed walking, bicycling, cooking, baking, shopping, and going to church. She also enjoyed decorating cakes and decorating her home with flowers. She loved spending time with her grandchildren. She was a member of St. Joseph’s Church in Peru and the Peru Eagles Lodge. Mrs. Ajster is survived by one son Steve Ajster of Peru, three grandchildren; Christie Ajster of Lake Barrington, Stevie (Sara) Ajster of Rancho Santa Margarita, CA, and Nicole (Isaac) Valadez of Westminster, CO, and three great-grandchildren; Lauren Murdock, and Cameron and Cuyler Ajster. She was preceded in death by her husband Joseph on November 14, 1990, two sons; Joseph R. Ajster, killed in Vietnam on October 5, 1968 and Rick J. Ajster on March 3, 1981, one grandson; Mikey Ajster on September 5, 2010, four sisters; Marie Cullinan, Dorothy Selke, Betty Mariani, and Barbara Ann Housby, and two brothers; Jay and Bob Housby. Pallbearers will be Christie, Stevie, and Steve Ajster, Nicole and Isaac Valadez.